This chart is a helpful guide to reference when planning a quilt and you will be using your own design and blocks. The numbers in the chart represent listed averages and include a pillow tuck and long drop on the sides and bottom. If you do not want a pillow tuck on your quilt, subtract ten to twelve inches from the length. For recommendations on what thread to use in your quilting projects, please view our quilting threads. 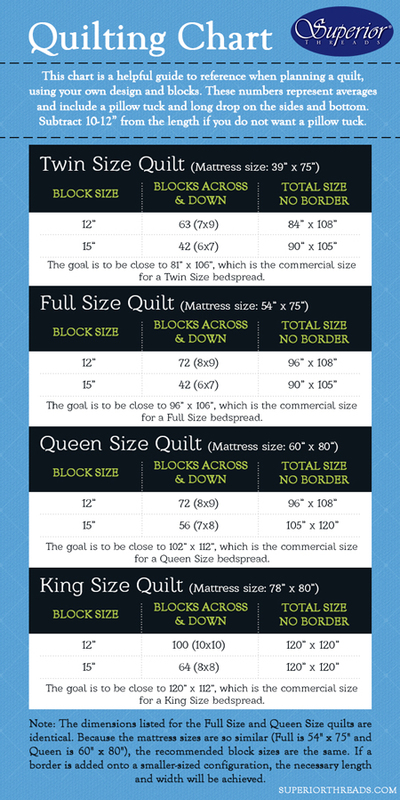 The dimensions listed for the full size and queen size quilts are identical. Because the mattress sizes are so similar (full is 54" x 75" and queen is 60" x 80"), the recommended block sizes are the same. If a border is added onto a smaller-sized quilt configuration, the necessary length and width will be achieved. There is roughly a six inch difference between a full and queen mattress. If a block is twelve inches, we can't cut the block in half to accommodate this difference. We can however, add a border around the quilt for extra width or length. Do you know how much thread it takes to quilt a quilt? View our How Much Thread To Quilt education article to learn how to estimate your thread needs.